We’ve been feeling the pressure to share our secret homescreen setup from some of you, so let’s go ahead and reveal it all! The launcher is LauncherPro Plus with a custom icon set and custom launcher button. The wallpaper is a quick black and white DL special that I made to fit this setup perfectly. 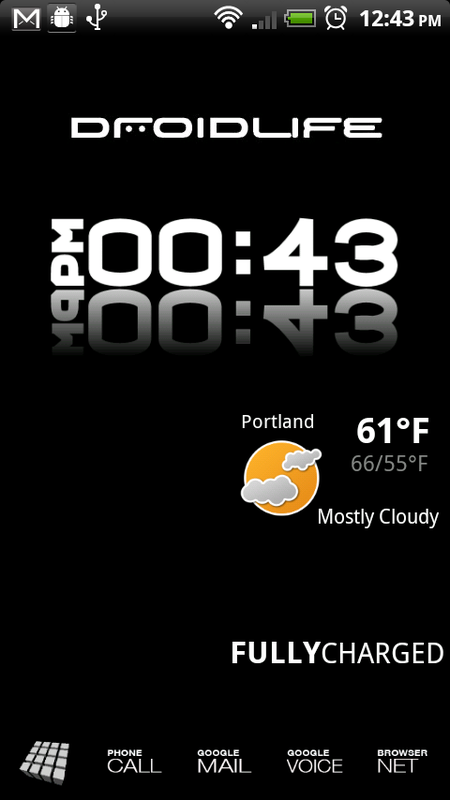 The clock is D-Clock Widget, stretched using LP Plus. The battery meter is called BattStatt. All download links and files after the jump! Credit: LP dock and word icons from Manup456’s rEVOlution theme. Credit: LauncherPro launcher icon by Kean. Inspiration: Reader davedemaria during our last “show off your homescreens” post. Want a DROID Tablet Now? Get One for $249!